Tool geometry has a direct impact on workpiece deformation, cutting forces, and tool wear, thereby affecting machinability, surface quality, and tool life. However, the research about the effect of cutter body geometry on cutting performance has rarely been reported. In this paper, the performance of the same series of indexable face-milling cutters with different diameters was investigated. The dynamic characteristic analysis results show that the cutter with diameter of 80 mm is the least susceptible to resonance due to the highest first-order modal frequency of 13,201 Hz. The cutter body geometry has a significant impact on mode shapes. The cutting performance tests show that the milling cutter with a diameter of 125 mm performs the best in terms of static force and maximum dynamic force in the Z direction and wear resistance. In view of the overall situation, the machined surface quality of the cutter with a diameter of 40 mm is the worst, whose abnormalities can be attributed to the vibration caused by the change of cutting depth and the formation and abscission of built-up edge. By the analysis of geometric structure, the center offset and the installation angle of indexable insert, together with the outline dimensions of the cutter body, jointly determine the tool cutting performance. The present work will provide guidance for the design of indexable milling cutters for high-performance machining of titanium alloys. 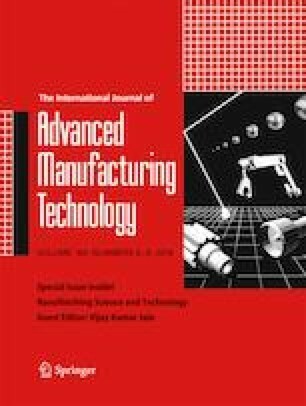 The authors are very grateful to the experimental platform provided by the advanced manufacturing and technology experiment center. This research is financially supported by the National Science and Technology Major Project of China (grant no. 2012ZX04003-021).